The Young Reserve Officer Seminar this year took place in Finland, near Helsinki. 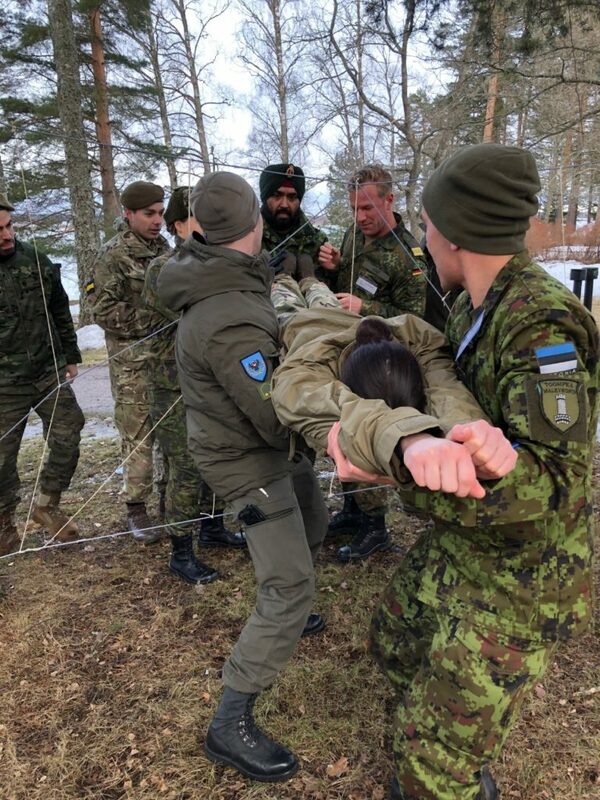 Some 40 young reserve officers from eleven countries attended the three day event and took part in practical and theory on cross-cultural leadership and related topics. Led by the YROW (Young Reserve Officer Workshop) Committee, the event has developed into a great introduction to the Young Officer programme of CIOR (Interallied Confederation of Reserve Officers). Hybrid warfare was another current topic, alongside a lecture on participation in international operations. The NATO Centre of Excellence for Countering Hybrid Threats (a.k.a. Hybrid CoE) supported the seminar. Swiss instructors were responsible for the daytime activities, whilst the Finnish hosts were responsible for the evening programme. The case task “The swamp”. All participants need to cross without getting their feet wet. One team mate is blind, another one is deaf, and the precious timber logs need to be brought back to camp. 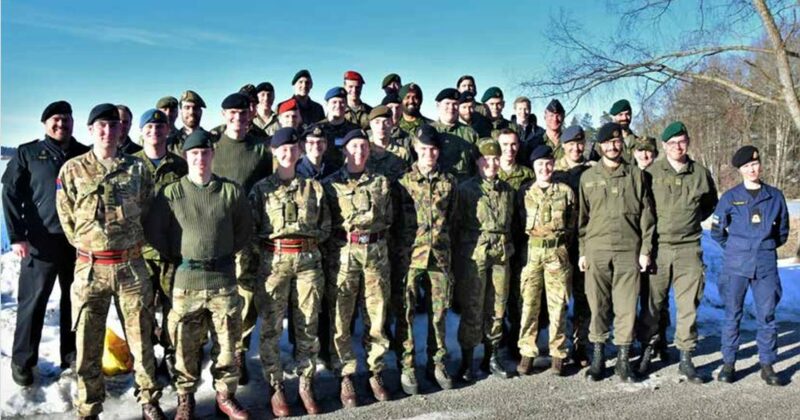 Some 40 Young Reserve Officers from eleven countries attended the three day event near Helsinki, Finland. The President of CIOR Colonel Chris Argent (Retd.) recently spoke at a conference on diversity in the armed forces, in Quebec, Canada. 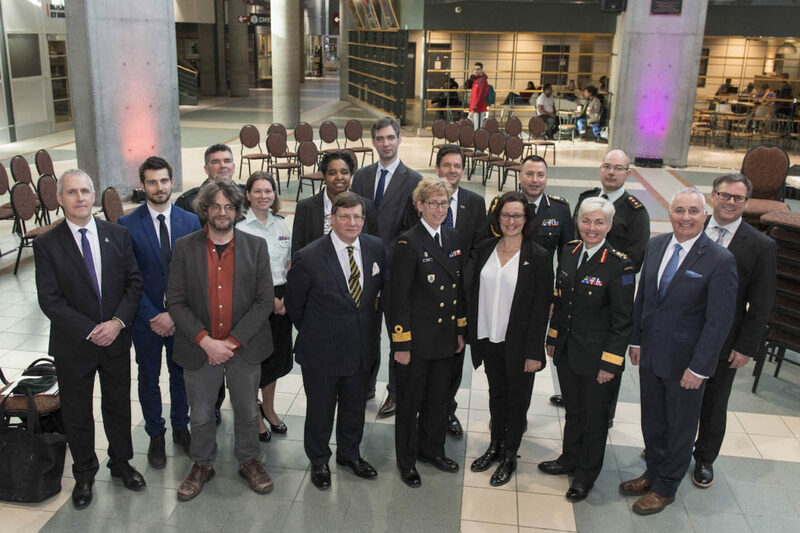 The conference, organized by UNIDEF (project management company in defense industry dealing with technology and know-how transfer of defense products) took place at Université Laval 27 March 2019. Des membres du commandement de la 2e Division du Canada, assistent à 10e rencontre Université Défense (UNIDEF) sur la thématique Diversité et Défense du Canada, à l’Université Laval, Québec, Qc, le 27 mars 2019. The CIOR President was amongst one and two-star military speakers from the Canadian, UK and French armed forces as well as academics from the university’s Security Faculty. The speakers addressed an audience of several hundred delegates. The CIOR President gave an overview on current progress in improving diversity in the armed forces, the challenges of recruiting the ‘millenial generation’ and the opportunities that the recruitment of a more diverse human resource component gives the armed forces to meet the challenges of future and changing threats to peace. Attendees to IBM2 are asked to arrange travel so as to arrive no later than the evening of 7 Feb 19. Due to a number of potential late arrivals no social function is planned for this evening. Meals will be available to order from the hotel or nearby restaurants. Those CIOR Members attending will be accommodated in the Radisson Blu SKY Hotel (Rävala puiestee 3, Tallinn, ESTONIA). Phone +372 6823 000. For questions about accommodation – Email info.tallinn@radissonblu.com. For guidance, delegate price per single or double room is 119 € per night. Price includes: buffet breakfast, wireless internet access and 9% VAT. There will be an optional programme of visiting EDF annual field exercise Spring Storm on 08th (0900-1800), CIOR VP shooting competition on 09th (0900-1200), meetings on 09th (1300-1700), 10th (0900-1700) and 11th MAY (0900 – 1200). There will be IBM Delegates Dinner (Social Gathering) in the Estonian Chamber of Commerce and Industry (https://www.koda.ee/en/about-chamber) on the evening of the 10th MAY. Attendees will be free to depart after 1230, 11 MAY 19. The Interallied Confederation of Reserve Officers (CIOR) and the Interallied Confederation of Non-Commissioned Officers (CISOR) presidents, Colonel (R) Chris Argent and Master Sergeant (R) Michel d’Alessandro, agree to look at what activities they might be able to collaberate on. The CIOR and CISOR presidents, Colonel (R) Chris Argent (left) and Master Sergeant (R) Michel d’Alessandro. They also agree to try to co-locate activity where feasible. Thirdly they explore how best to leverage the power of Reserves so they can contribute better to NATO. To formalize the cooperation, CIOR and CISOR leadership have signed a Memorandum of Understanding (MoU). This happened when the CIOR President visited and addressed the CISOR Central Committee Meeting in Hanover on Saturday, February 9th. The ideas on how to make the two organizations work together were warmly received from both sides, and there is now a determination to make this opportunity work for respective reserve cohorts . Tallinn, Estonia, host city for the 2019 CIOR and CIOMR Summer Congresses. The largest annual meeting of these two organizations is jointly held each summer in a different country and is organized by a separate member of CIOR/CIOMR each year; in 2017, the Congress was held in Prague, Czech Republic, in 2018 Quebec, Canada and in 2019 Estonia will be hosting the congress in its capital of Tallinn and surrounding areas. Program: the two congresses are organized in conjunction with CIOR having Council meetings, the various committees and working groups and the CIOMR Congress conducting meetings with their respective committees. There will also be military competitions (MILCOMP) and other activities such as CIMIC exercises (CIMEX), Young Reserve Officers Workshop (YROW), CIOR Language Academy (CLA), the CIOMR Workshop and a Congress Symposium. Participants’ accommodations are available at several hotels in Tallinn. The main hotel being the Radisson Blue for CIOR/CIOMR committees, and the Nordic Hotel Forum for the YROW participants. Congress rooms are also available at the Swiss Hotel, all in the downtown area of Tallinn. The opening ceremony of the Congress is on Sunday August 4th at the Maarjamäe memorial, followed by a reception at the Maarjamäe palace. The CLA will have already been active since July 20th at the Estonian Academy of Security Sciences in Tallinn and will be finished on the opening day of the CIOR/CIOMR congress on August 4th. The MilComp section will start training on the 4th and end on the 5th with competitions on the 6th to 8th. The awards ceremony will be on the 9th of August. All events take place at the Estonian Defence League Männiku shooting range on the outskirts of Tallinn. 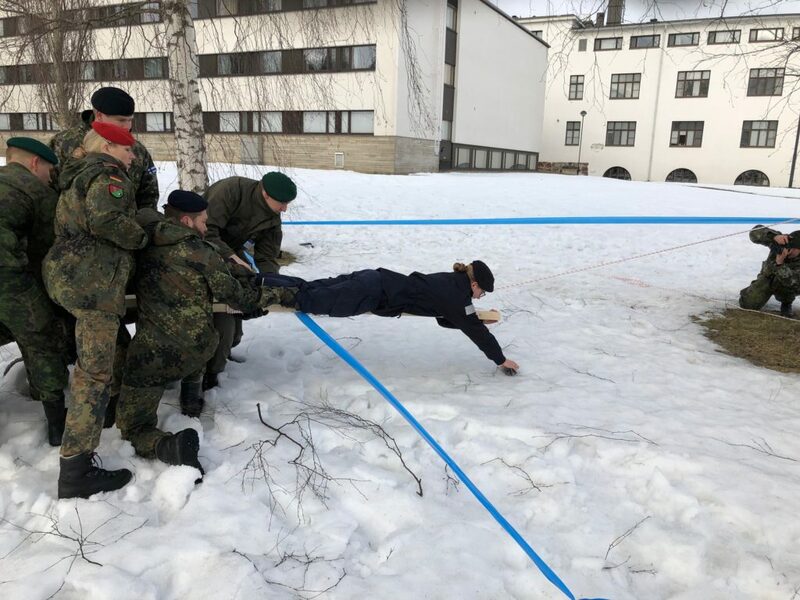 CIMIC, work exercises (CIMEX) are from the 4th to the 6th at the Estonian Academy of Security Sciences in Tallinn. Participants to the CIMEX exercise will join the rest of the Congress as soon as they conclude their exercise. The Congress Symposium will be held on Wednesday August the 7th at the Swissotel in Tallinn. The Closing Ceremony/Congress Gala Dinner will take place on Friday August 9th at the Seaplane Harbour Museum in Tallinn, which will officially close the CIOR/CIOMR 2019 Summer Congress in Tallinn, Estonia. The National Reserve Forces Committee (NRFC) and the Confédération Interalliée des Officiers de Réserve (CIOR) come together once more to enhance their partnership during the CIOR Mid Winter Meeting at the NATO HQ in Brussels. From 29 to 31 January, NATO hosted simultaneous meetings of the National Reserve Forces Committee (NRFC) and the Confédération Interalliée des Officiers de Réserve (CIOR). Both organisations renewed their joint Memorandum of Understanding (MoU) to continuously improve cooperation. On 30 January, the joint session started off with a keynote address by the Deputy Chief of Staff of Allied Command Operations, Lieutenant General Olivier Rittimann. The General highlighted the value of Reservists as “a capable, credible and available force which continues to be an important element of the Force structure. For some Nations reservists make up almost 50% of their National forces which is understandable when requirements increase but defence spending does not follow. Whereas 20 years ago, reservists were considered more of a last resort, nowadays they are considered incremental to any Nation’s Armed Forces, providing the manpower and specialised skill to supplement regular armed forces”. The meeting was also an opportunity for the NRFC Chairman and the CIOR President, respectively Brigadier General Robert Głąb (POL) and Colonel (R) Chris Argent (UK), to renew their joint Memorandum of Understanding (MoU). The result of a year’s work, the MoU aims to establish a cooperative and productive relationship between the two organisations as well as outline their partnership and channels of communication. “The NRFC and CIOR are complementary organisations, the first focusing on the Reserves and the second on Reservists. It only made sense to renew this MoU to make sure that where possible we complement each other. The aim is also where and when possible to present a united front and joint advise to the NATO Military Committee. 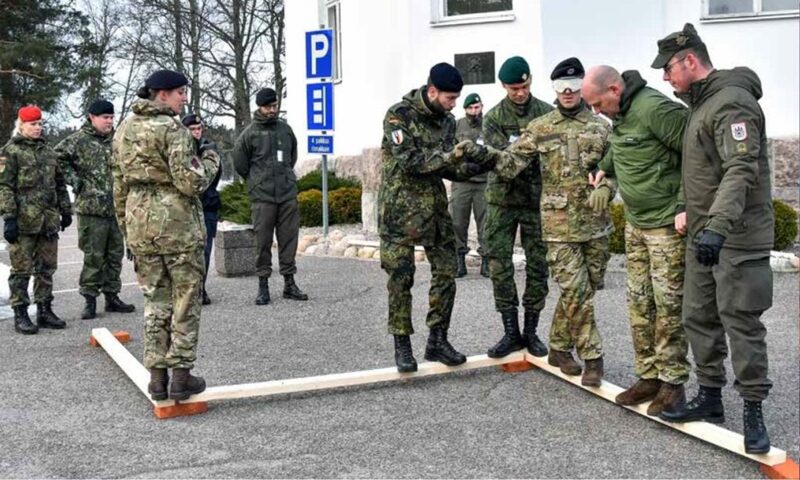 We can only be stronger together”, added Brigadier General Robert Głąb. NATO has always recognised the importance of national Reserve Forces and the compelling requirement to better understand and exploit the inherent potential of reservists and Reserve Forces. NATO works on reservist issues through three different entities: the National Reserve Forces Committee (NRFC), the Interallied Confederation of Reserve Officers (known by its French acronym CIOR) and the Interallied Confederation of Medical Reserve Officers (CIOMR). The 2019 CIOR Seminar on “Warfare 2030 – Technology, Policy, Ethics” was held in Bonn (Germany) from January 26 to 29, 2019, with young CIOR reserve officers as well as seasoned members from many NATO participating countries. This three-day seminar addressed present and future developments concerning means of warfare. This includes development on autonomous devices, on social media/InfoOps, policy development in these domains, ethical aspects regarding these developments, addressing legal aspects regarding these developments, and how we deal with non-state actors, having access to these new techniques and possibilities. To address these topics, CIOR has been able to attract speakers from NATO countries, all subject matter experts. A spokesperson from the British Army discussing on the impact of PsyOps at the CIOR Bonn Seminar on Warfare 2030 “Technology, Policy, Ethics” held from January 26 to 29, 2019. Un représentant de l’Armée britannique, discutant de l’impact des opérations psychologiques durant le séminaire de la CIOR organisé à Bonn, du 26 au 29 janvier 2019. “Information warfare is truly the understanding of the art of influencing, and I think that in the future, internet will play an even greater part in influencing populations,” says Major Geoff Nicholls, from the British Army. “While George Orwell used to say “He who controls the past, controls the future” I think it would be right to say in today’s age that “He who controls the internet, controls the future”. Overall, an impressive event that helped us better understand the potential impact CIOR could have over the Warfare 2030! Le séminaire 2019 de la CIOR sur «La guerre 2030 – Technologie, Politique et Éthique» s’est achevé à Bonn (Allemagne) du 26 au 29 janvier 2019, réunissant de jeunes officiers de réserve ainsi que des membres chevronnés de la CIOR de nombreux pays participant à l’OTAN. Ce séminaire de trois jours a porté sur les développements actuels et futurs concernant notre compréhension et vision de la guerre de demain. Ceci inclut le développement sur des dispositifs autonomes, sur les médias sociaux / Opération d’Information, le développement de politiques dans ces domaines, les aspects éthiques relatifs à ces développements, le traitement des aspects juridiques liés à ces développements et la manière dont nous traitons les acteurs non étatiques, en rapport à ces nouvelles techniques et possibilités. Pour aborder ces sujets, la CIOR a pu profiter des intervenants de pays de l’OTAN, tous experts en la matière. Workshop session on Science-Fiction movies and the link with 2030 warfare with Ms. Isabella Hermann at the CIOR Bonn Seminar. Atelier sur les films de science-fiction et le lien avec la guerre de 2030 avec Mme Isabella Hermann durant le séminaire de la CIOR organisé à Bonn. “La guerre de l’information est vraiment la compréhension de l’art d’influencer et je pense que dans l’avenir, l’internet jouera un rôle encore plus déterminant pour influencer les populations”, a déclaré le Major Geoff Nicholls, du Royaume-Uni. “Alors que George Orwell disait:” Celui qui contrôle le passé, contrôle le futur “, je pense qu’il serait juste de dire de nos jours que “Celui qui contrôle l’internet, contrôle le futur “. En somme, un événement impressionnant qui nous a permis de mieux comprendre l’impact potentiel de la CIOR sur l’environnement de la guerre 2030! CIOR held the first In-Between-Meeting (IBM) of the UK / Estonian Presidency in Tallinn from 15 to 17 November. -I was very pleased to welcome over 60 delegates from our member Reserve Associations, and especially the President of CIOMR and the President of CISOR, said CIOR President, Colonel Chris Argent (R). Improving CIOR’s Financial Management – for which I have appointed three Vice Presidents to constitute an advisory working group. – Besides the plenary discussions of Council, the Secretary General and I met Committee Chairmen and discussed and guided their work plans, all of which are tuned to the Presidency Theme ‘’The Young Reserve Officer’’. – This was also a unique occasion as I was particularly pleased to have some very meaningful discussions with the President of CIOMR [Interallied Confederation of Medical Reserve Officers] and the President of CISOR [Interallied Confederation of Non-Commissioned Officers], during which we discussed closer future collaboration of all three confederations during an Office Call with the Chief of Defence of the Estonian Armed Forces, General Terras, who has taken a keen interest in our affairs. – We were most privileged to be addressed by the Estonian Chief of Defence (Designate) and the Head of the Estonian General Staff, and to be invited to the Centenary Celebrations of the Estonian Armed Forces at which the President of Estonia was present. This proved a fitting climax to a most successful meeting, and I am most grateful to the Estonian members of the Presidency Team for their exceptional organisation and management of the meeting. The Estonian Chief of Defence speaks at the the Centenary Celebrations of the Estonian Armed Forces. – I am very pleased with the Outcomes of the IBM in putting into effect our ambitious Manifesto, the co-operation and commitment which all delegates made to the meeting, and I look forward to welcoming the maximum number of CIOR delegates to the Mid-Winter-Meeting (MWM) to be held in Brussels at NATO Headquarters from 29 January to 1 March 2019, the CIOR President said. More than 60 delegates from CIOR member Reserve Associations, the President of CIOMR and the President of CISOR had very fruitful discussions at the In-Between-Meeting in Tallinn in November. Estonians bravely pledge to defend themselves “in all circumstanses and against all adversaries, no matter how overwhelming”. Colonel Veiko-Vello Palm, Head of the Estonian General Staff designate delivered an impressive and very honest and straightforward presentation of the country’s armed forces to the CIOR In-Between-Meeting audience. Estonians bravely pledge to defend themselves “in all circumstanses and against all adversaries, no matter how overwhelming”. And most of the country’s armed forces are actually made up of reservists. The small Baltic country of 1,3 million people has an army of merely 3,500 men and women in continous service. So the large corps of dedicated and well trained reservists are indispensable to Estonia’s national defence. Colonel Veiko-Vello Palm, Head of the Estonian General Staff designate delivered an impressive and very honest and straightforward presentation of the country’s armed forces to the CIOR In-Between-Meeting audience. Estonia’s regular reserve forces count 14,000. The national Defence League provides an additional strength of 6,000 reservists. The Defence League is a paramilitary defence organization whose aim is to guarantee the preservation of the independence and sovereignty of the state, the integrity of its land area and its constitutional order. The Defence League possesses arms and engages in military exercises. The organization is divided into 15 Defence League regional units, called malevs, whose areas of responsibility mostly coincide with the borders of Estonian counties. Estonia is one of few NATO nations that has reached the Alliance’s expressed goal of spending at least two per cent of its annual Gross Domestic Product (GDP) on defence. Steadily climbing over the last several years, the defence budget now amounts to 520 million Euros, which is 2,17 per cent of GDP. Estonia is one of few NATO nations that has reached the Alliance’s expressed goal of spending at least two per cent of its annual Gross Domestic Product (GDP) on defence. Estonian reserve officer association table flag. By: Roy Thorvaldsen, CIOR PA Committe Chairman. The opening session of the CIOR In-Between-Meeting in Tallinn, Estonia. The CIOR In-Between-Meeting (IBM) 1 in Tallinn, Estionia, kicked off this morning. The Chief of the Estonian Defence Forces designate, Major General Herem, opened the morning session, and received the CIOR Plaque by CIOR President, UK Colonel Chris Argent (R). The Chief of the Estonian Defence Forces designate, Major General Herem, addressed the audience at the start of the morning session, and received the CIOR Plaque by CIOR President, UK Colonel Chris Argent (R). The following meeting between the National delegations discussed a new draft Memorandum of Understanding between CIOR and the National Reserve Forces Committee (NRFC). CIOR and NRFC has a close working relationship in addressing reserve affairs issues and potential within the NATO and associated member nations; in addition, both organizations provide advice to the NATO Military Committee at NATO Headquarteres in Brussels, Belgium, on the use of reserves in Alliance operations. The agenda also included deciding on the dates and locations for future events and candidacies for future presidencies, among other management issues. The day was closed with a presentation on Estonian Armed Forces by Colonel Palm, Head of the Estonian General Staff designate. Following the opening session the meeting discussed a new draft Memorandum of Understanding between CIOR and the National Reserve Forces Committee (NRFC).